We provide any hard surface repairs specialist services in London. Our man can fix any hard surface damage and make repairs magically invisible. This week we had residential property worktop chip repair in Stratford, East London. 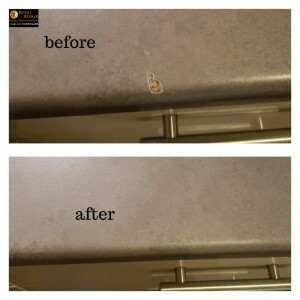 Repair was completed in 4 hours and worktop repair is completely invisible. Unbelievable what our trained surface repairs Specialist can achieve recreating damaged surfaces on sites in London . London surface Restoration company pride to repair any residential and commercial property surface damages. Your laminate worktop chipped, burned or got scratches and needs to be fixed? Granite worktop edge chipped stone counter top?